A tweet from Respawn Entertainment’s CEO and founder Vince Zampella surfaced last weekend saying, “Celebrating 10 Million! Thanks to everyone, we love you all!” along with an image of employees celebrating in Respawn’s office. He is talking about last year’s much anticipated game, Titanfall, a multiplayer FPS that was released March of 2014. This is Respawn’s first game ever released which has recently reached the 10 million mark across the globe, making it one of the biggest FPS on the Microsoft platform. Although it was not specified if the figure is about purchases or unique users, it is still a very impressive feat. Congratulations, you guys! Titanfall was made available for PC, XBOX One and XBOX 360. Given the limited platforms it was released for, it slowly but surely reached the 10 million milestone. Now that the game is made more readily available, it can be accessed free for XBOX ONE via EA Access and also in Origin Game Time for PC. In addition to that, they attempted to unify the player base by making all DLC’s available to everyone for free earlier this year. With all these exciting news, a lot of players are hoping for a Titanfall sequel. Any wish lists for Titanfall 2? Let us know in the comments! 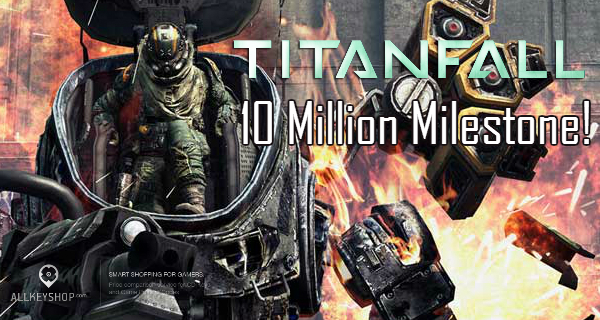 Titanfall is the best game ever.10 million milestone is great achievement for the company.wish you best of luck. I hope there will be a Titanfall 2!